Lordran. Used to face chaos demons. of their adversaries long ago. Dropped by the (non-respawning) halberd-wielding Black Knight near the bonfire in Darkroot Basin. Dropped by the (non-respawning) halberd-wielding Black Knight near Patches in Tomb of the Giants. Dropped by the halberd-wielding Black Knight (the last Black Knight) in the Kiln of the First Flame. Like all Black Knight weapons, this weapon deals extra damage to demon enemies such as the Taurus Demon and Capra Demon. 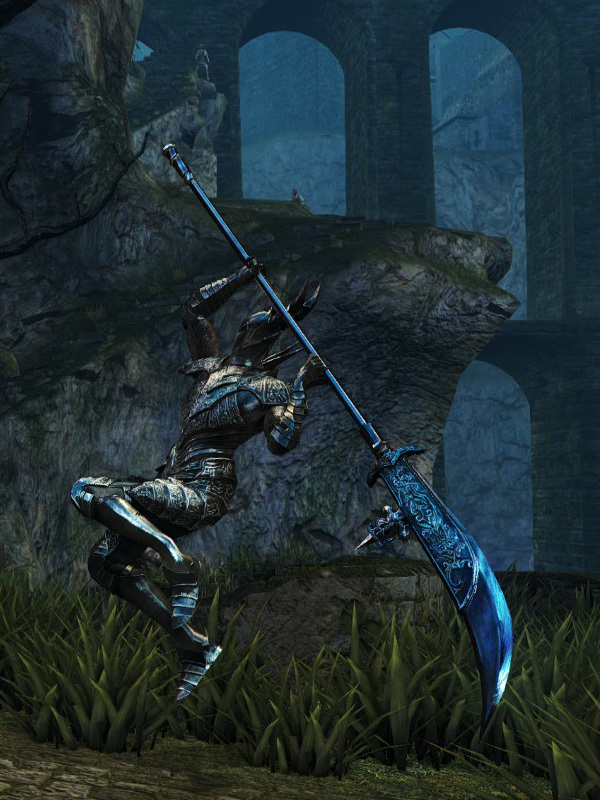 This weapon has higher poise damage compared to other halberds. Like all other halberds, its weak attacks receive counter hit bonuses, which may be increased by the Leo Ring. Its other attacks receive no bonuses. One-handed strong attack is replaced by a a circle-and-a-half swing. Two-handed strong attack is replaced by a downward swing with dashing start. 44% STR, 2% DEX scaling.